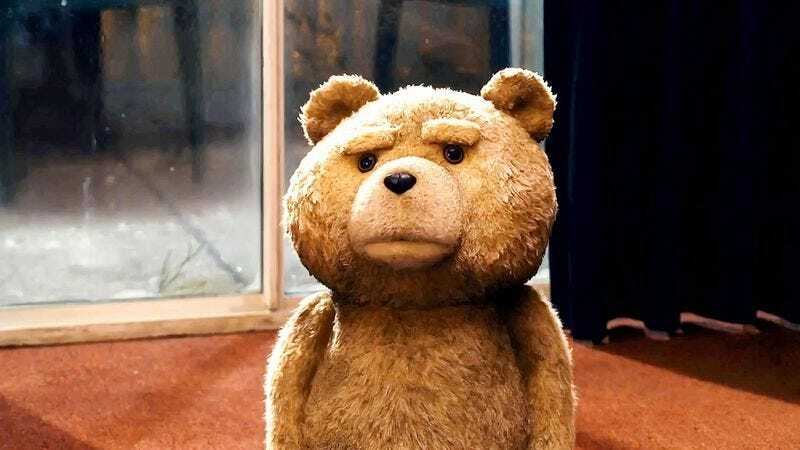 In what is the most damning accusation of plagiarism Seth MacFarlane has received this week, Bengal Mangle Productions has filed a lawsuit claiming that his R-rated hit Ted stole the idea for a foulmouthed teddy bear from its character Charlie The Abusive Teddy Bear, who first appeared in a series of Acting School Academy web videos it created in 2008. The suit cites numerous similarities between Ted and Charlie, as well as many of the general characteristics you might imagine a “foulmouthed teddy bear” possessing: “Both Charlie and Ted spend a significant amount of time sitting on a living room couch with a beer and/or cigarette in hand,” it reads. “Both Charlie and Ted use vulgar language, solicit prostitutes, drink alcohol, and use drugs.” Which, yes, that definitely sounds like a foulmouthed teddy bear. Slightly more damning, the suit goes on to point out that both characters are “washed-up” former child stars, and share commonalities in appearance and attitude—elucidated in a specific, scene-by-scene comparison between Ted and episodes of both Acting School Academy and Charlie’s spinoff series. There’s also a side-by-side chart of social media posts from each character that demonstrate at least a few superficial similarities, namely of the limited range of dirty jokes one can make about being a teddy bear. It’s not the first time Ted has been accused of plagiarism: Upon the movie’s release in 2012, Editor & Publisher noted similarities between it and Lucas Turnbloom’s webcomic Imagine This, also created in 2008, which also features a drunk, vulgar, violence-prone teddy bear. Unlike Bengal Mangle, Turnbloom—though reportedly “devastated” by Ted—declined to pursue any sort of action, acknowledging the difficulties in proving those similarities were evidence of theft. And indeed, with Imagine This and Acting School Academy both launching the same year with the same idea—presumably independently of each other—it seems like it would be easy for MacFarlane’s team to argue a defense of parallel thinking. It may simply be that a foulmouthed teddy bear is a collective dream we all weave at one point or another.